This second edition features 64 classics including the original 53 classics plus 11 additional wooden boats - comprising four classics and seven contemporary classics. In this book, Andrew Harper and David Millar take the reader on a fascinating journey, beginning with a historical overview of Moreton Bay and the local boat building industry. The journey then takes the reader on board 64 locally built classics, looking at every handcrafted detail. David’s photography is spellbinding and captures the vessels in their local environment, be it Moreton Bay, Sydney Harbour, Hobart or the Swan River in Western Australia. Andrew’s research chronicles the fascinating history of each vessel ensuring that the individual histories are documented for future generations. 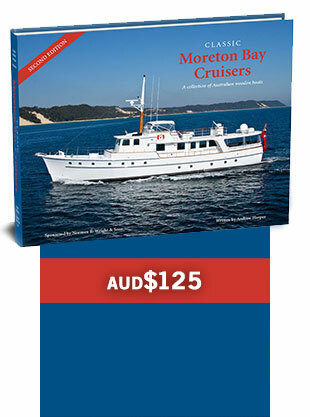 ‘Classic Moreton Bay Cruisers’ is a limited release destined to become a cherished collector’s item. An early order will avoid disappointment. This magnificent hardcover book presents 468 pages of classic wooden boats. Format is a generous size (300 x 240mm). This beautifully illustrated book features 64 boats and over 500 photos.